While violent conflicts over rare metals used in our phones and laptops continue and e-waste keeps piling up, engineers break their heads over new ways to ensure that products die quicker. It takes 244 kg of fossil fuel, 21,8 kg of chemicals and 1.5 tons of water to manufacture one computer and monitor. Carsten Wachholz, product policy officer from the European Environmental Bureau: “To offset the energy consumed to manufacture a laptop, it must be used for more than 20 years, even with a 20-30% efficiency improvement rate over that time”. The opposite is happening: computers made in 2010 have a 10% shorter lifespan than those made in 2000. The same goes up for cell phones, iPods and so on. Unsurprisingly, the amount of e-waste created in the world keeps rising exponentially, to over 50 million tons of e-waste, annually. The idea of planned obsolescence started with light bulbs, nylon socks and cars but it has now moved to all electronic devices, textbooks, washing machines, microwaves, software and almost every product that can possibly break or become ‘old-fashioned’. Engineers are asked to make sure that things go to the dump faster so you need to buy a new one quicker. This makes lots of money for the companies, but it has some nasty side-effects: increasing material and energy consumption on a planet with shrinking stocks and increasing waste. These are major drivers behind environmental injustices, which we have carefully mapped over the last three years of research. So let’s take a closer look at this source of so many evils and on how to stop it. When one looks up the definition of “Planned Obsolescence” in Wikipedia, it scratches on the surface: “The rationale behind the strategy is … reducing the time between repeat purchases … There is an information asymmetry between the producer – who knows how long the product was designed to last – and the consumer, who does not.” In plain English: producers fool consumers while hoping to see them again sooner and sooner. 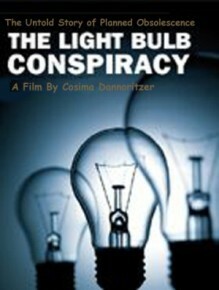 A good starting point to find out more is to watch The Light Bulb Conspiracy. This award-winning documentary traces the story of planned obsolescence. In the 1920s, light bulbs lasted 2500 hours on average, but by 1940 the average had become 1000. Official documents showed in the documentary found that a secret cartel from the 3 biggest producers at the time agreed that no light bulb should last longer than 1000 hours and members would have to pay fines to the cartel based on how much over this limit their light bulbs lasted. In 1932 Bernard London wrote “Ending the Depression Through Planned Obsolescence.” He wanted the government to make planned obsolescence on consumer articles compulsory by law, to stimulate and perpetuate consumption. But why make it public and enforce it by law when companies do it secretly – thus avoiding the difficult public explanation of why it is needed to make things less good? When Dupont invented Nylon socks in 1940, tests were made on the wives and daughters of the engineers who made them. They didn’t show any signs of developing ladders. That was a bad business model. So Dupont’s engineers were ordered to make them less strong. In 1960, cultural critic Vance Packard published The Waste Makers, promoted as an exposé of “the systematic attempt of business to make us wasteful, debt-ridden, permanently discontented individuals”. The book describes the manipulation of ordinary people by business interests. Mainstreaming planned obsolescence created a growing stream of waste. Some of this is recycled in high-consuming countries, where advanced technology is available to win a few grams of gold from a pile of broken cell-phones. But 80 to 85% of electronic products are discarded in landfills or incinerators. E-waste represents 2% of America’s trash in landfills, but it equals 70% of overall toxic waste. This is where the Lawrence Summers’ Principle kicks in. The former lead economist for the World Bank infamously wrote (in a leaked internal memo) that “A given amount of health impairing pollution should be done in the country with the lowest cost”. Approximately 80% of the annual 3 million ton of e-Waste produced in the U.S. is exported to Asia, where millions of people are dealing with severe, widespread and long lasting damages caused by this waste stream. There’s been a lot of discussion lately to call that ecocide. On the other hand: it is equally true that the e-waste doesn’t always come from Europe or the West in general. The United Nations Environmental Program predicts that by 2017 Africa will produce more e-waste than the EU. According to a report by UNEP titled, “Recycling – from E-Waste to Resources,” the amount of e-waste being produced – including mobile phones and computers – could rise by as much as 500 percent over the next decade in countries like India. But confronting planned obsolescence at the producer side would slow down all waste streams – no matter where the products were made, sold and used. *Glue will ensure that your business model sticks. Instead of arming products with the usual replaceable batteries, Apple glues them to the product. Battery broke? That’ll cost you around 100 dollars, takes a week and Apple will erase your phone’s memory. For iPods it’s even worse: repair costs more than buying a new one. And when some guys post a guideline online on how to do it yourself, Apple just invents its own screws to make sure that you can’t open and repair it. *Chips. Not the potato version, the IT ones. You can hide them deep inside a printer. It will tell your naïve product users on an idle Tuesday morning that their printer, sadly, no longer works. Instead of telling us to empty or clean out the waste cartridge the printer tells us the printer needs (expensive) repair or replacement. 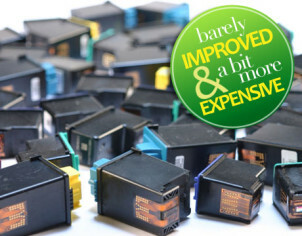 Chips are also used to tell people that the ink has run out – even when up to 64% of the ink is still in the cartridge. Never mind that each large laser printer cartridge requires about three quarts of oil and 2.5 pounds of plastic to make. *Soften it. Why use durable materials in sensitive places if you have something that is more likely to break? Open that washing machine, dishwasher, microwave or fridge and find the parts you can replace with softer versions. Most “smart” producers already do that. *Incompatibility: you’re an IT-freak with a knack for making applications and games? Think of a series of games and make sure to prevent backward compatibility – as most competitors do. Same goes for software, where backward compatibility is often eliminated on purpose. Planned obsolescence isn’t limited to newer kinds of technology. 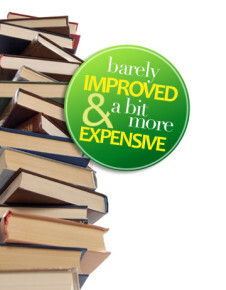 Even though not much changes from year to year for most core subjects, textbook publishers issue frequent updates. Trouble is, each new edition is usually printed with the information shifted to different page numbers, making it difficult to follow along in class with a previous volume. The reasons educational publishers stoop to such tactics is quite clear, though in order to maintain profits they have to make their otherwise durable product “expire” somehow. However, many student groups are now organizing to provide cheap second hand versions with simple guidelines on modified use. Then there’s of course the absurd idea of having a new fashion at every new season. For some insights on when, where and how humanity evolved into a fashion sensitive specimen: check one of Naomi Klein’s books on this subject: No Logo. To be brief: whether it’s because of cuts, hemlines or colors, a lot of what is advertised and sold is designed to go out of style in a short time. The solution here is rather simple: don’t believe the hype and don’t become a fashion victim. The offer in second hand clothing has become much more diverse and well spread – allowing for an escape route. The variety of options for failure-creators is limitless. Their enemy? Consumers like Tim Hicks. Tim fixes laptops. He used to have a website with every single laptop manual in pdf, until Toshiba’s lawyers forced Tim to remove manuals for over 300 Toshiba laptops. Keeping manuals offline ensures the only path for beleaguered customers is sending broken devices back to high-priced, only-manufacturer-authorized service centers. By making it so expensive and inconvenient to repair broken electronics, many people simply throw the devices away. But Tim still has most manuals online and he’s not alone. A network of fixers and repair-doctors has blossomed on the internet including a Youtube video that explains how to get your printer with evil malfunction chip working again. 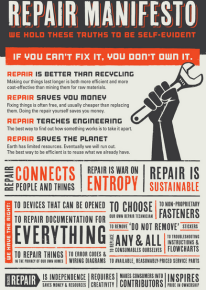 At iFixers they’ve created a repair manifesto – with the aim of inspiring people to repair more stuff and thus become part of an eco-activist movement, with slogans to “join the revolution” and the baseline “if you can’t fix it, you don’t own it”. People are also organizing in repair cafés where volunteer do-it-yourself people enjoy repairing your objects, for free. For those understanding French, here’s a very interesting website full of solutions, made by the French ‘Friends of the Earth’. And then there’s Stefan Schridde who has carefuly build up this resourcefull website filled to the brim with information and solutions to planned obsolescence. All these initiative offer solutions for consumers. On the producer side, things are also moving. One option is to work with take-back schemes, although this is only feasible for the big manufacturers who will then put that cost back into the price. But that doesn’t have to be a problem. In a recent Eurobarometer, 77% of 26,573 respondents said they are willing to pay more for environmentally-friendly products if they were confident that the products are truly environmentally-friendly. Another Eurobarometer showed that 27% have used sharing schemes, involving the sharing of cars or bikes or item such as a lawn mower. And 21% say that they have leased or rented a product such as a washing machine instead of buying it. The leasing sector is also broadening to ever more products. Philips, for example, is now offering Lifecycle Services Performance contracts for light bulbs. Planned obsolescence is not a conspiracy theory. It’s a business-model that has become standard in many industries as it’s a built-in feature of the growth-religion. This religion is currently busy with destroying the conditions that make life on earth enjoyable for humans. But this doesn’t mean that we’re doomed. It’s rather that their business-model is doomed and alternatives exist. On the one hand, we need governments to tackle the issue. Most governments regulate a whole range of products, but specific attention to planned obsolescence is needed. On October 1 the Austrian government launched a new label of excellence for durable, repair-friendly designed electrical and electronic appliances. France adopted new consumption laws on 17 March 2014, including several rules explicitly aimed to prevent planned obsolescence. 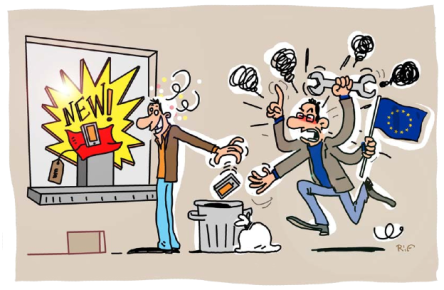 On 14 October 2014 they went further, making planned obsolescence a crime that can be punished with up to 2 years in jail and a 300.000 euro penalty. You know that the EU is doing some good things under the Ecodesign Directive if even a newspaper like The Telegraph is convinced of the usefulness of the legislation on efficient and long lasting vacuum cleaners. Regulation however is the result of a constantly evolving battle between consumer-activists on one side and corporate lobbies on the other side. You win some, but you lose many. So we need people like Tim and Michel Bauwens from the peer2peer foundation who help consumers to find ways to circumnavigate the trap by getting together either online, in repair-café’s or in whatever way they want. There is clearly a trend in this direction and for many people it’s all about bridging the information gap: the majority just doesn’t know that free support and an economy of the commons actually exists and is more accessible than thought. The mainstream media has failed to read the signs on the wall as they are too busy producing content related to the advertisements that they need. In the capitalist economy, failure of a product has become a feature. But outside the market, people work together to fix problems with solutions that last. So the good news is that you don’t need to be that fashion victim, the consumer slave who’s frustrated at every toaster and printer suddenly breaking down. There’s a world out there with people that solve problems, bit by bit. Arte made this beautiful info-graphic on e-waste, available in German and in French as part of a wide range of resources on e-waste.